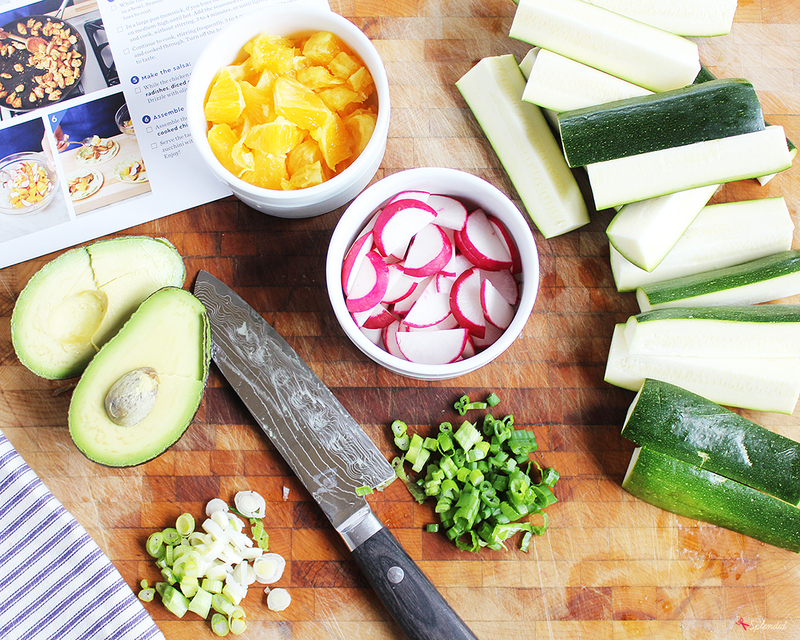 I’m sharing these great tips for meal planning in partnership with Blue Apron. All opinions are entirely my own. 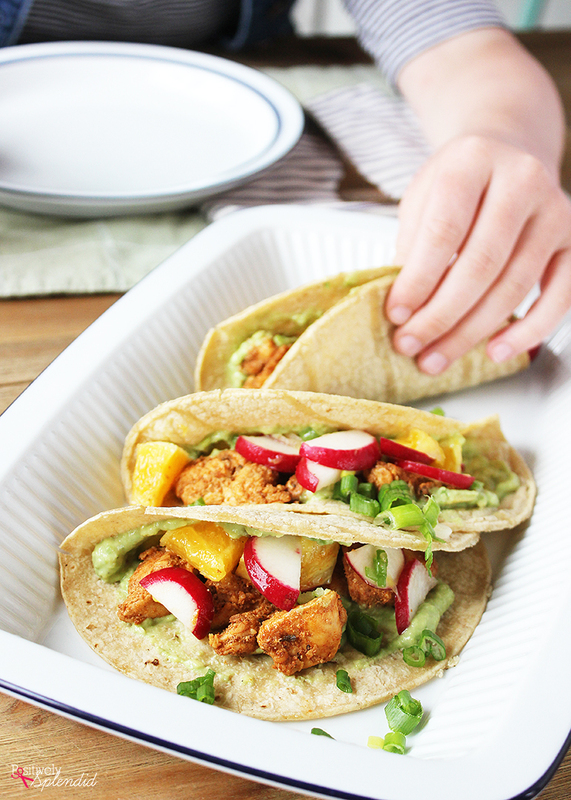 With four kiddos active in a number of activities, meal planning is truly the most crucial, sanity-saving part of our weekly routine. Each and every week, I plan ahead for what we will eat for dinner each night so that I never have to fear the inevitable “Mama, what’s for dinner?” line during the witching hour at 5 PM, when we are trying to get homework done and then hurry off to our next practice or commitment. Today, I’m going to share five great meal-planning tips with you, including how Blue Apron can become a smart part of any menu-planning routine by reducing the time and effort required to plan your weekly menu! And don’t miss the details at the end of the post for a great offer from Blue Apron, which gives the first 50 people to sign up $50 off their first two weeks! If you know that Mondays are your busiest day of the week, don’t plan something overly elaborate for that day! Identifying some favorite recipes that can be made in 30 minutes or less is a good idea for those days you know will be hectic. Grab a notebook of some sort, and each week, jot down the menu plan and any notes associated with those recipes. 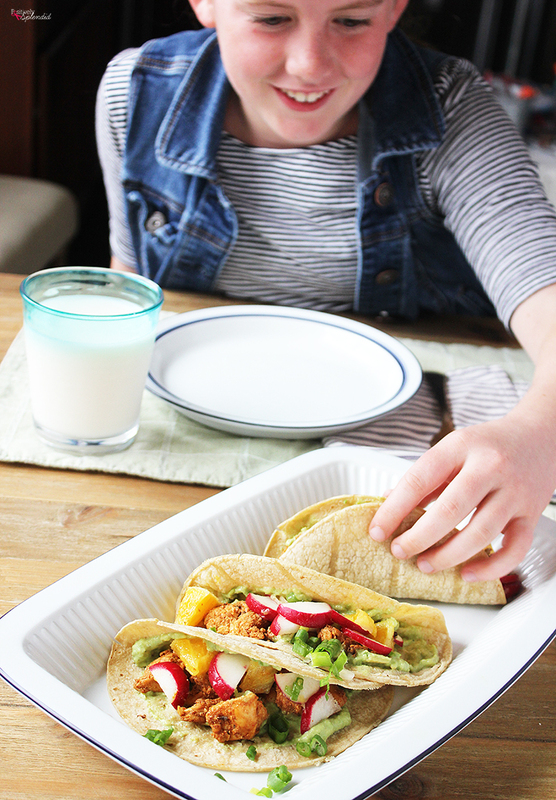 Did your family absolutely love the new chicken dish you prepared? Put a start by that so that when you are planning for future weeks, you have an automatic go-to recipe to add, saving you a ton of time in the long-run. Families are so much more likely to stick with and enjoy a meal plan when they are all involved in the planning and prep. Ask your kids to jot down some of their favorite ingredients and recipes. Turn on some fun music as you cook dinner in the evening and have your children help cook. Having a planned meal gives you an opportunity to make mealtime a nightly time to connect. Blue Apron takes the guesswork out of coming up with delicious recipes to prepare each week, and all of the ingredients to prepare the recipes are shipped straight to your doorstep, which means you will save time and waste by only having on hand exactly what you need. For starting off on a meal-planning routine, this really is a game-changer! From start to finish, our first experience with Blue Apron was so easy and enjoyable. There are two subscription options available–the 2-Person Plan and the Family Plan–and the family option was definitely the best fit for us. I was really impressed with the array of recipes available (there are 8 different recipes each week to choose from), and the fact that I was able to order everything with just a few clicks of a mouse and then receive all of the fresh, perfectly portioned ingredients and recipe instructions at my home just a few days later was nothing short of amazing. You can even specify food allergies and preferences so that the recipes are tailored exactly to your tastes and dietary needs. The ingredients all incredibly fresh, and exactly the quality I would pick out myself. 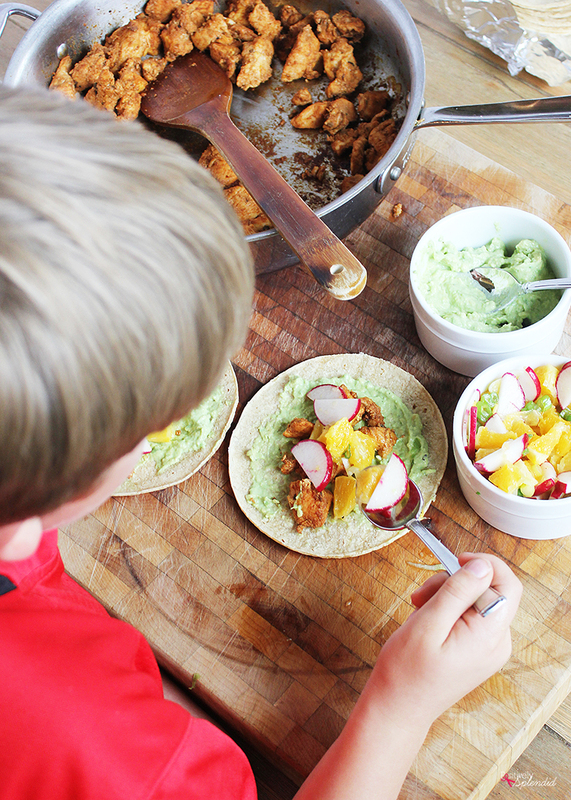 My kids absolutely loved helping me prep the yummy Mexican Spiced Chicken Tacos for our weekly Taco Tuesday tradition. 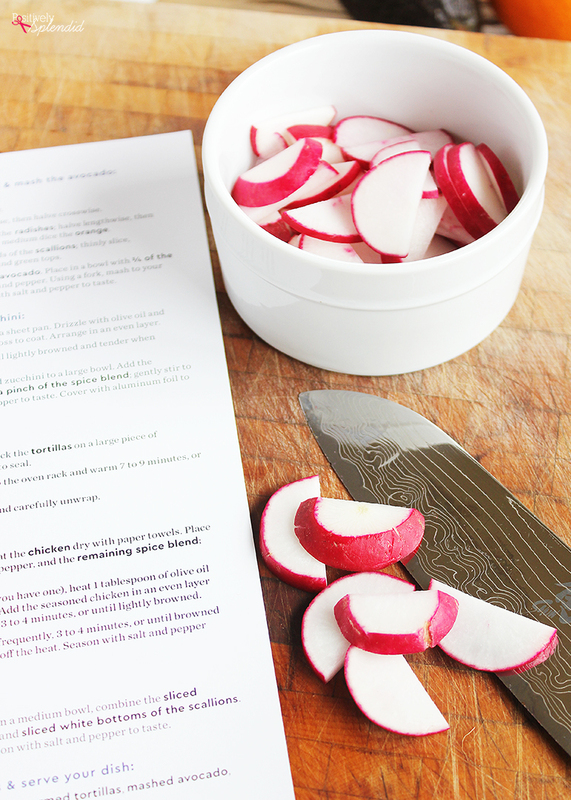 It was so helpful that each step was clearly outlined in the helpful recipe card provided, and the orange and radish salsa we made to go with our tacos was so delicious, my 6-year-old son has declared radishes to be his new favorite vegetable! How cool is that? Overall, I have to say that for busy families, Blue Apron really can be the key to keeping up with a delicious, healthy meal plan you’ll be glad to stick with! 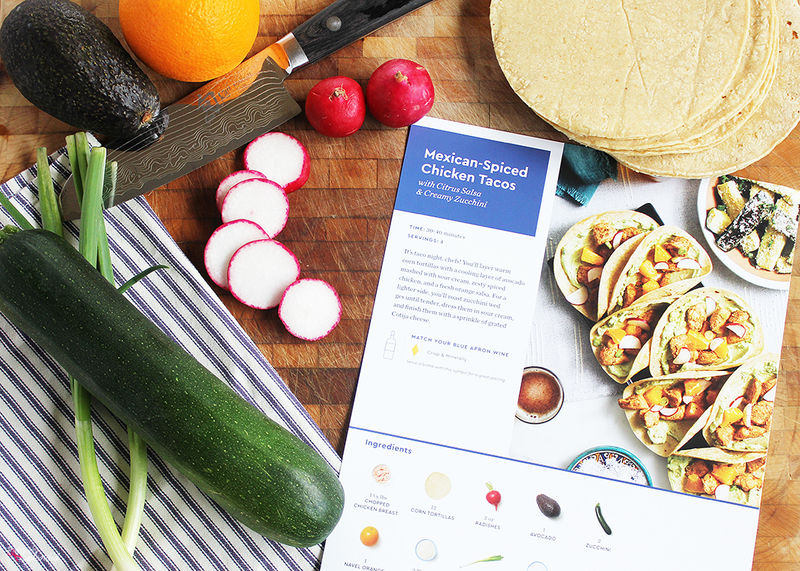 Ready to try Blue Apron for yourself to kickstart your meal planning? The first 50 people to sign up will get $50 off your first two weeks of Blue Apron! P.S. Looking for even more meal planning ideas? You can read more about my best meal planning tips here and here.